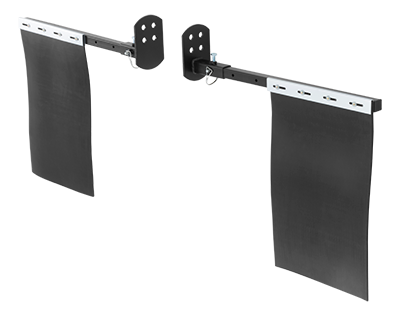 Order Removable Universal Mud Flaps at ARIES Automotive With a pull-pin attachment system, ARIES mud flaps can be installed whenever you need them and removed whenever you don't. ARIES mud flaps mount onto virtually any truck, Jeep or SUV with a universal bracket. The 3/8" thick rubber flaps can then be attached or detached whenever necessary, using the pull-pin release system. These mud flaps also have a no-drill fit on the Jeep Wrangler JK. At ARIES, we stand for bold attitude and innovative style. Whether you're proving yourself on the trail or conquering the urban jungle, ARIES gives you something that no one else can offer, something that allows you to stand out with your own unique style. There's a big, wide world out there waiting to be explored. Enjoy more of it with ARIES. From camping under the stars to blazing a new trail, our products are engineered for adventure. Take that truck, SUV or 4x4 offroad where it belongs. ARIES has the unique accessories to let you stand out on the trail and withstand an onslaught of mud, rain, sticks and stones. Work hard and play even harder with ARIES. When you've got a job to do, ARIES lets you conquer it with confidence. And of course, look good while you're at it. Tear up the asphalt jungle or take things offroad. Whatever your passion, ARIES offers a unique advantage. Our products are built to match your innovative style and aggressive attitude. Make yourself the king of the asphalt jungle with ARIES. Whether you're cruising the avenue or parking out at the club, we offer unique and stylish accessories to soup up that street truck, SUV or Jeep. Upgrade, transform and unleash your Jeep Wrangler with ARIES. It's your passion, and we offer the unique, specialized accessories to take your Jeep from roadworthy to offroad-ready. Give your truck a classic look or customize your classic truck with accessories that are built to match. ARIES offers wide vehicle coverage to build out your truck, whether it's your hobby or way of life.